Citation SCUTELLARIA INCANA Biehler, Pl. Nov. Herb. Spreng. 25. 1807. Type: PENNSYLVANIA: Lancaster Co.: Without data, Muhlenberg s.n. (holotype: HBG?). Scutellaria altamaha subsp. australis Scutellaria altamaha Small, subsp. australis Epling, Univ. Calif. Publ. Bot. 20: 89. 1942. TYPE: ALABAMA: Houston Co.: 10 mi. S of Dothan, 10 Aug 1927, Wiegand & Manning 2782 (holotype: GH). 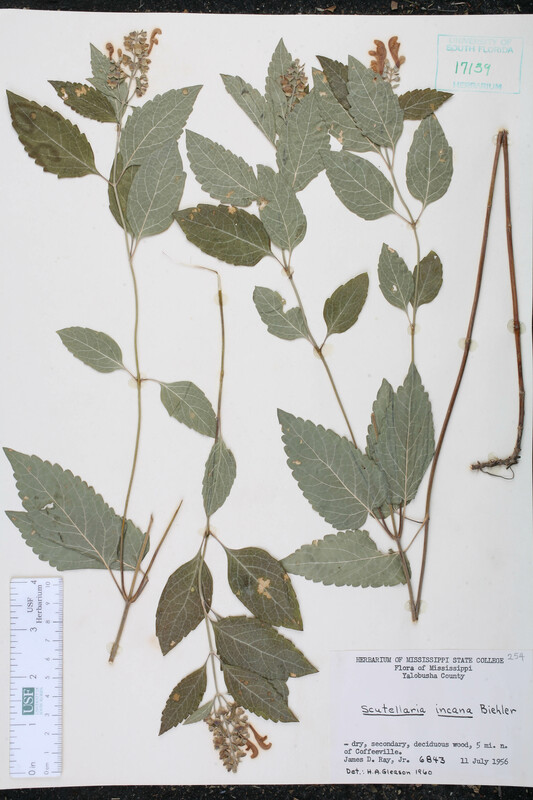 Scutellaria altamaha var. australis Scutellaria altamaha Small, var. australis (Epling) D. B. 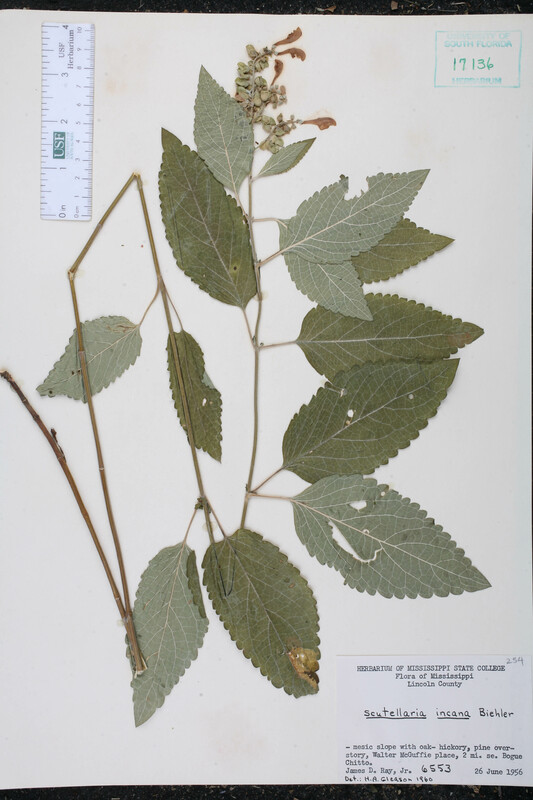 Ward, Phytologia 94: 474. 2012. 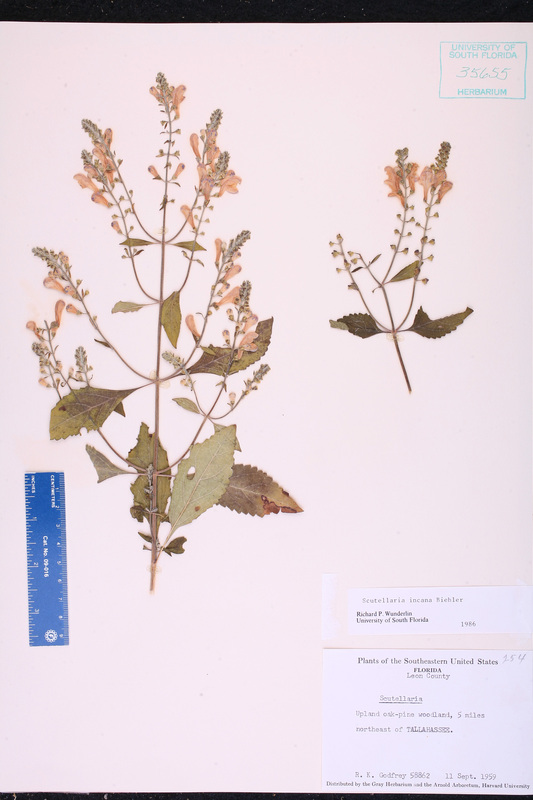 BASIONYM: Scutellaria altamaha Small, subsp. altamaha Epling 1942. 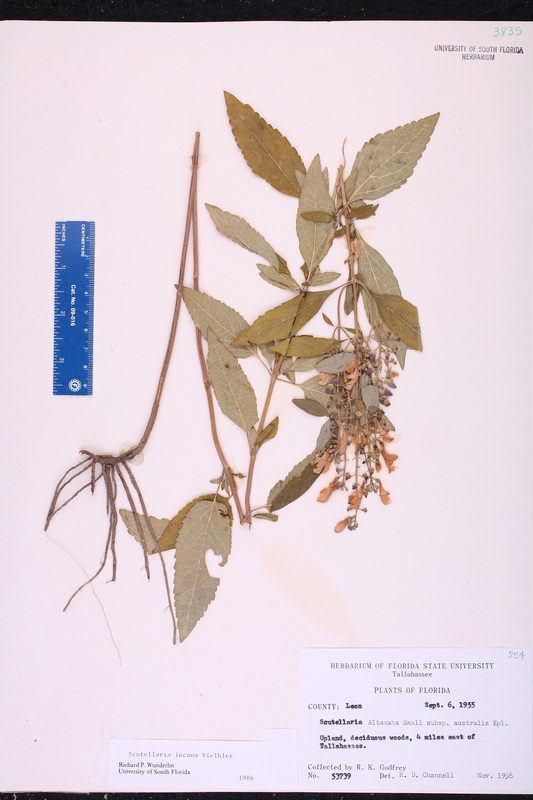 Scutellaria canescens Scutellaria canescens Nuttall, Gen. N. Amer. Pl. 2: 38. 1818. TYPE: OHIO: Scioto Co.: Near Portsmouth, s.d., Nuttall s.n. (holotype: PH; isotype: BM). Scutellaria canescens var. punctata Scutellaria canescens Nuttall, var. punctata Chapman, Fl. South. U.S. 323. 1860. 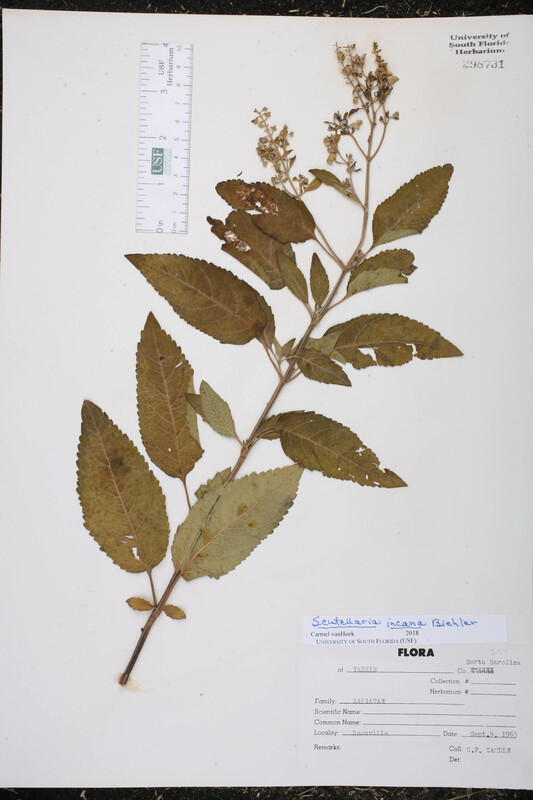 TYPE: GEORGIA: Floyd Co.: Near Rome, s.d., Chapman s.n. (holotype: US?). Scutellaria incana var. punctata Scutellaria incana Biehler, var. punctata (Chapman) C. Mohr, Bull. Torrey Bot. Club 24: 26. 1897. 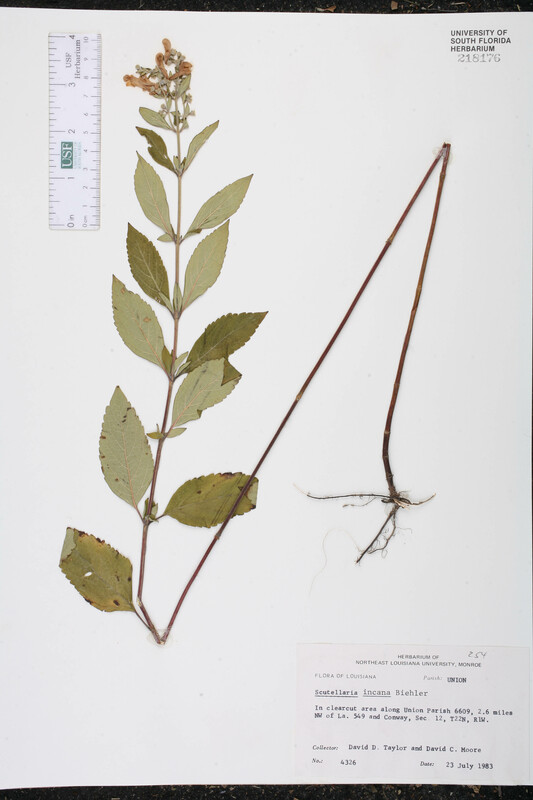 BASIONYM: Scutellaria canescens Nuttall, var. punctata Chapman 1860. Scutellaria mellichampii Scutellaria mellichampii Small, Fl. S.E. U.S. 1022, 1337. 1903. 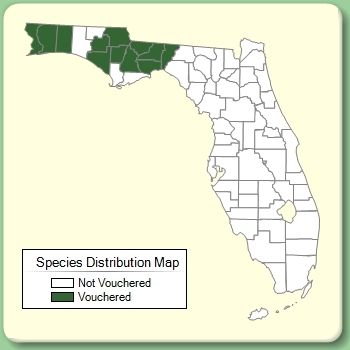 TYPE: SOUTH CAROLINA: Beaufort Co.: Bluffton, s.d., Mellichamp s.n. (holotype: NY; isotype: NY). Scutellaria punctata Scutellaria punctata (Chapman) Leonard, Contr. U.S. Natl. Herb. 22: 743. 1927. 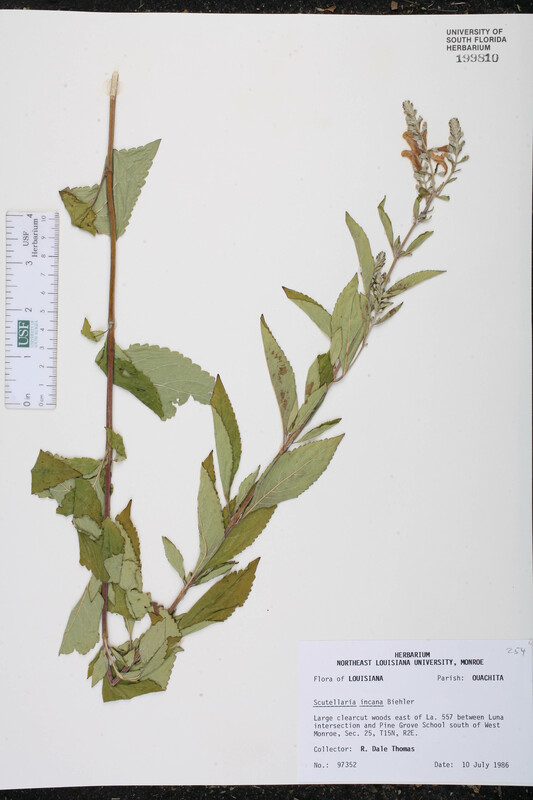 BASIONYM: Scutellaria canescens Nuttall, var. punctata Chapman 1860. 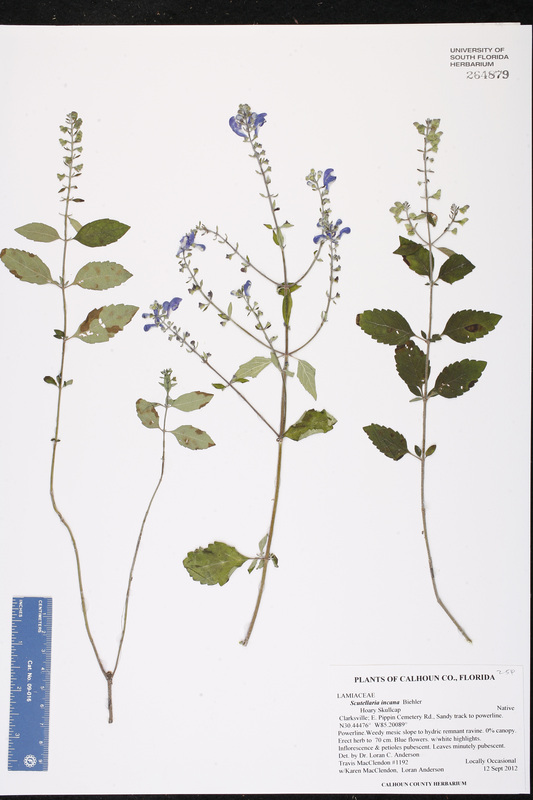 Scutellaria incana forma rhodantha Scutellaria incana Biehler, forma rhodantha Mohlenbrock, in Mohlenbrock & J. M. Voigt, Fl. S. Illinois 291. 1959. TYPE: ILLINOIS: Perry Co.: 2 mi. S of Matthews, 25 Jul 1954, Mohlenbrock 356 (holotype: SIU).